Samford University’s School of the Arts is hosting about 350 students from 110 schools for the 10th annual Samford Honor Band Jan. 7–9. The program brings middle and high school musicians to campus for a variety of workshops and instruction sessions. Students go through an application and recommendation process before they are chosen to attend, according to Demondrae Thurman, Honor Band coordinator and Samford music professor. Many schools sending students are from Alabama, but there are students from Florida and Arkansas, as well. “The idea is for this to grow beyond the state of Alabama,” Thurman said. Beginning on Thursday, students will participate in workshops and instructional sessions taught by Samford professors, other college music academics, and prominent directors and teachers from around the state. The Honor Band program will culminate on Saturday with four concerts, two featuring middle school students and two with high school students. Thurman will lead one of the high school bands while Mark Norman, conductor of the University of Wisconsin—Milwaukee Wind Ensemble, will conduct the other. The middle school bands will be conducted by Jonathan Hill, director of bands at Red Bay (Alabama) High School, and Leigh Thomas, director of bands at Bob Jones High School, Madison, Alabama. The Honor Band also features a $2,500 scholarship to pursue a music degree at Samford. The recipient will be selected by Thurman and the audition faculty. 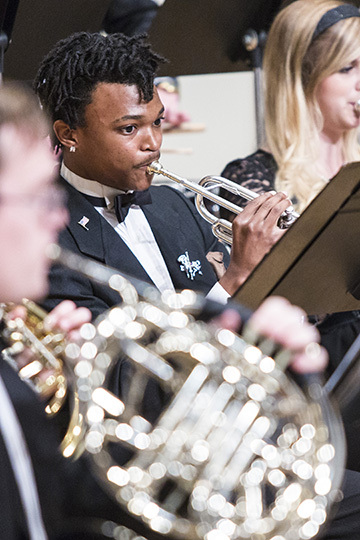 The Honor Band concerts will take place on Saturday beginning at 2:30 p.m. in Samford’s Wright Center Concert Hall.